In the Critique of Pure Reason, Kant writes of what he calls the "transcendental object," and he refers to it sometimes as the "= x." Das ding an sich--the thing in itself. Kant's point when writing about the transcendental object is that objects are somewhat slippery to the human mind. Kant believes that we never truly apprehend things as they are. We see, instead, a kind of messy blend of sense-impressions and mental concepts. His ultimate point: the thing in itself is unknowable. Little known fact: Kant won the Koenigsburg Turkey Trot 5k 5 years straight (1750-1755). Two years later an achilles injury led him to hang up the flats and turn his obsessive mind towards becoming a billiards hustler. Though this sounds a bit like skepticism, Kant's view is different from common-sense skepticism which essentially denies any capacity for knowledge. Though Kant believed we could never apprehend the world as it is, he thought we could apprehend it better. We could refine our mental concepts so that they better mapped onto the world. We could also improve our capacity for sensation--we could learn to sense the world better so that our intuitions of objects become riper and fuller. This is the purpose of science, art, and also of education. The experimental method allows us to isolate concepts and test whether or not they match up well with the objects they are meant to represent. Artists experiment as well, teaching us to experience the world in new ways through painting, music, literature, film, etc. They give us new angles on sensation, allow us to feel, see, taste and hear differently. A well-developed mind is able to sense the world richly--and it also has the conceptual apparatus to be able to express and share those sensations. Intelligence, on the Kantian view, doesn't just allow us to manipulate the world better. It gives us the capacity to experience the world more fully, to live in it more deeply, and to share it with others. This is a great story, and it is mostly true. There is a tension, however, between the conceptual work of intelligence and the aesthetic, sensitive work. We've all experienced the way in which overanalyzing experience can strip it of its vague, sensed peripheries--the "gray areas" that are not merely the excess of a concept but are rich and vital centers of experienced life. The gray areas of life are usually not gray at all. They escape intellectualism through their vibrancy and polyvalence: their inability to be captured by the rigid categories of the mind. We've also been frustrated--on the other hand--by our muteness before some of our most profound experiences. Life is buoyed by intuitions, epiphanies, and moods, most of which we can only gesture towards in language. In running, too, there is this difficulty. Many of the best endurance athletes are able to externalize their bodies, to treat them as an object, with scientific precision. This is what Alberto Salazar and Galen Rupp have been doing with Rupp's body over the course of the years. They have a 20 year plan for his development. They treat the body of Rupp with almost scientific precision, measuring its adaptation, its biochemical markers, charting a path that is aimed at athletic perfection. Though most of us who take our running more or less seriously are not nearly as relentless (or intelligent) in the scrutiny of our bodies, part of the joy of distance running is in treating one's body as an object: controlling its efforts, its fuel, its recovery, learning how it adapts, etc. In this way, we treat it as if we can truly apprehend it in itself. One mark of an objectified body is the removal of hair from the legs. But curiously this objectifying of the body also threatens to alienate us from the body. The other joy of distance running is in living in a body, feeling a body, becoming a body (what Deleuze calls "becoming animal".) In order to run and race well, there has to be a moment when the mind of the runner is overcome by the body. We stop analyzing, stop externalizing, and we race. We annihilate the conceptual half of the mind and let it be overcome by sensation. We get in the flow and we go. In these moments, we do not apprehend the body as an object--the body apprehends us. We do not "know" the body; we become it. If Rupp did not have the ability to do this, to perform this feat of mind-immolation, he perhaps could put up some great statistical performances in the lab, but he would never be able to compete on the world stage. If Rupp knows how to listen to the music, he also knows how to play it. It strikes me that these are two different forms of discipline, each of which we have to practice in training. On the one hand, we have to learn to externalize ourselves, to see ourselves from the perspective of a coach or another runner. Otherwise, our training lacks coherence and organization. This is where running logs and heart rate monitors and various other instruments of analysis are useful. On the other hand, we also have to practice becoming our bodies, which is something else entirely. This aspect of training has more in common with artistic practice than scientific method. The discipline of becoming the body means practicing being overwhelmed by sensation, moving with it, letting it organize you, repattern your mind and your movements. Otherwise, our training lacks freedom and creativity. 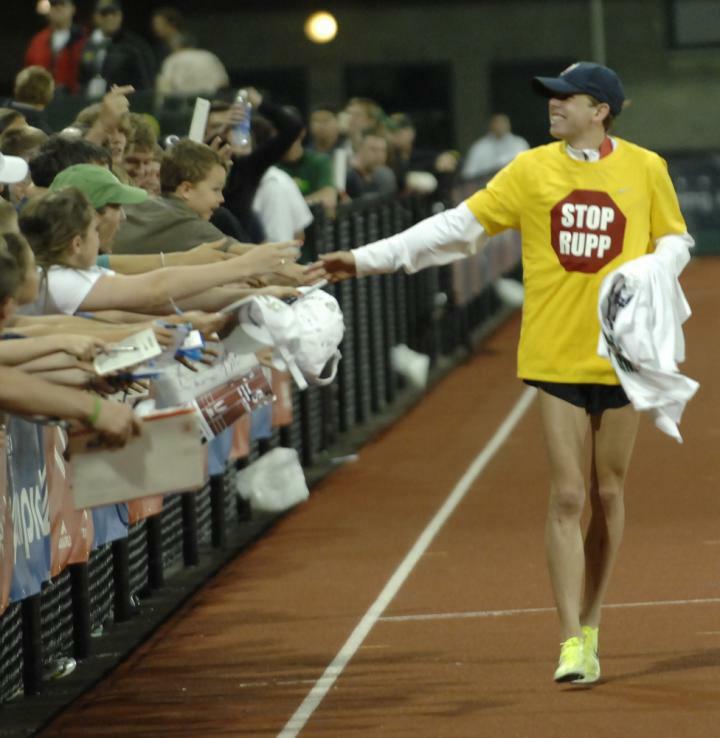 If Rupp symbolizes the externalization of the body taken to the extreme, perhaps Henry Rono is the epitome of the runner who races and trains intuitively. Read this account of Rono racing. Too often these two modes of discipline are put into opposition, but running teaches us that in experience both elements are essential. The body is two types of object. It is both something other than me, and it is me. The challenge is not to choose one or the other of these relations, but to keep them both living. We feel and analyze, each in its own measure, according to its own discipline. Perhaps if life could be reduced to the categories of the mind or the categories of sensation, we would know more fully who we are. We could attain some sort of absolute knowledge. The runner would know, through analysis, exactly how fast he could race a marathon. Salazar would know, absolutely, what Rupp can or can't do. We can't know, but this is no cause for skepticism. We can know better. The runner understands this: life is not about the knowing; it is about the trying. What the skeptic sees as a failure of the human mind, the runner sees as a chance to understand better, to become faster, to be different. Like life, running is an adventure in uncertainty. We follow hunches and intuitions, half blindly. This is what makes intelligent analysis, when we are able to muster it, so valuable. But those moments that analysis cannot reach give us the thrill, the impulse, the doubt, and the desire that wrap us up, consume us, and carry us ever-onward. Firstly, the quips beneath the picture were highly entertaining. I agree with the idea that you need both "art" and "science", and that it goes beyond running to any endeavor we strive to be "better" at. As I stated in a thread once, I see tremendous merit in the gathering of all sorts of minute data about one's running, if only for the ability to look back and spot trends. Trend-spotting is a skill that is also just as much science as it is art, and is only developed through practice. I also agree that far too often people put themselves into an "either/or" camp, where they fail to embrace the other side of the coin. Just like the best runners are able to successfully blend the science with the art, so too can the best software engineers blend the science of programming with the art of programming. It's about bringing together abstract concepts into a concrete form, subjecting the form to rigorous testing, then refining or scrapping the form. Thanks for the reply. I remember that post well. To paraphrase a thought from William James: "Intelligence primarily consists in knowing what to pay attention to." This is even more true in a world where information is cheap. Knowledge looks a lot less like the ability to acquire facts or data and more like the ability to discriminate the relevant from the irrelevant. Along those lines, I recently read a news article that talked about a study showing that people have begun to rely more heavily on digital devices for remembering facts. Essentially, the study concluded that people in the current digital age are less adept at remembering basic things like dates and such, because it has become so easy to simply look it up. I believe this was all in response to an article a while back in The Atlantic that discussed how Google was making us stupid. Anyway, the point is that instead of simply becoming dumber, when the mind no longer has to focus on maintaining a list of factoids, it is free to explore more abstract concepts, thus becoming more creative. The downside to this, of course, is when we are separated from our wonderful devices and left on our own. We become helpless almost. I see this in running. People feel like the science gives them all they need, and they ignore the sensations of running. Then, when they discover that the science doesn't answer every problem, they have lost their ability to live without hard data. Extreme case, obviously, but I know I have seen various shades of this issue for a while now (think "I can't run without my music!!!"). I joke with my students that my email is my memory; that if they just tell me, but don't send me an email they are running a risk that I will forget. A search engine is a more efficient mode of recall. It's hard to know where exactly to become dependent, and where we should insist on remaining independent, or pure. Different folks will draw the line in different places, for different reasons. What seems essential to some, seems trivial to others. In my experience, what begins by seeming "essential" usually ends up, over time, being qualified and restricted to a particular form of life or way of being or use. As we spend more time with something, we become aware of its limits and fatigued by what intially seemed promising. Though we can learn these limits from other folks, it's hard to settle what is most important in advance--since the question of "importance" is always relative to someone, somewhere, sometime, for some purpose. A yoga teacher I had in Dayton once said "think less, feel more"...good advice for yoga, running, or (for those of us prone to over-analysis) life in general. Indeed, Rachael! (Though I guess the Kantian ideal would be "think *more*, feel more.") Maybe in this we should be Aristotelian: "think enough, feel enough."